Performers include: Jodie Comer, Aneurin Barnard, Richard Rankin, Valene Kane, Natasha Little, Stuart Graham, Katherine Rose Morley, Joe Layton, Eleanor Wyld, Chipo Chung, Nicholas Farrell, Kemi-Bo Jacobs, and Ariyon Bakare. 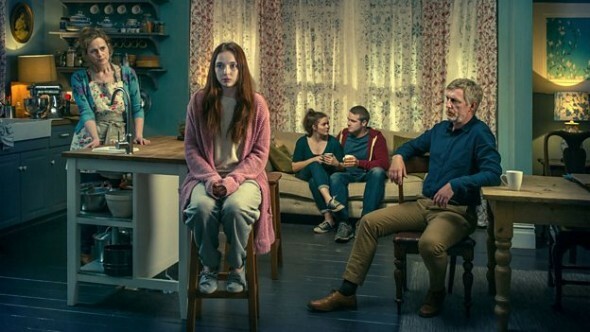 This five-party mystery thriller follows Ivy Moxham (Jodie Comer) on the day she escapes the cellar where she has been held prisoner for the last 13 years of her life and returns home to her family. Ivy Moxam was a well-loved daughter and sister before being kidnapped. A late bloomer, Ivy was quite close to her first boyfriend, Tim Hobson (Aneurin Barnard) and best friend Eloise Wye (Eleanor Wyld). In captivity, Ivy lived a dark and lonely life. After escaping, she finds it hard to be all things to all people. She wonders if she will ever truly feel free. Christina Moxam (Natasha Little) put her life on hold for her husband and children. After Ivy’s abduction, she devoted herself to finding the girl and never gave up hope of getting back her girl. Once Ivy returns, Christina has to accept this happy ending is not playing out the way she dreamt it would, for all those years. Angus Moxam (Stuart Graham) was proud of his marriage to Christina and how well she was rearing their daughters, but gave the best of himself to work. When Ivy was kidnapped, he had a total breakdown. As part of his recovery, he had to accept that Ivy was dead. This drove him apart from Christina and their other daughter. Now that Ivy is home, Angus must choose between his old life and the new one he has created for himself. Emma Moxam (Katherine Rose Morley) was just coming into her own, when her big sister Ivy was snatched. Her parents tracked her every move and breath during her teen years. She passed on pursuing an academic career, in order to stay close to her mother. Emma is secure in her relationship with fiancé Craig Watts (Joe Layton). Now that Ivy is home, Emma must watch her family struggle with the cracks in their relationships. When Ivy disappeared, her boyfriend Tim was destroyed. With the help of his parents, he eventually got himself together and moved on. Today he is married to Yazz (Kemi-Bo Jacobs). Seeing Ivy after all these years stirs up feelings that make him feel torn between his past and the present. After her best-friend was kidnapped, Eloise went from being a bit of a wild child to utterly self-destructive. Now that Ivy’s home Eloise takes stock of her bad choices and tries to turn over a new leaf. A widower, Henry Stone (Nicholas Farrell) is the principal of Ivy’s old school. His work is his life. He wondered about Ivy daily. He must deal with the fallout of his past choices and concede he knows more about the case than either the police or the community realize. The Moxams never expected to see Ivy again. Upon her return, they try to recreate the way their lives were, before she was taken from them. Christina contends Angus must leave his girlfriend, return home, and never tell Ivy about their breakup. Christina does not warn Emma about this, so she is revolted by the lies, once she realizes what is going on. Ivy is unable to feel safe or at peace, especially when she learns her kidnapper is still on the loose. Detective Inspector (DI) Elliott Carne (Richard Rankin) and Detective Sergeant (DS) Lisa Merchant (Valene Kane) are assigned to the case and to protect Ivy. The partners have a close relationship which goes beyond friendship, particularly in Merchant’s heart. Their relationship is put to the test as Carne grows obsessed with protecting Ivy. Ivy is the only person who knows her abductor. Only she can help Carne and Merchant catch him. As time passes, they begin to suspect she is not being completely honest with them. As she struggles to stay sane, their doubts about her grow. There are inconsistencies in her statement, errors, and even lies. Should they trust Ivy? Everyone wonders what happened in the cellar. Uncovering the truth is an uphill battle. First aired: July 21, 2016. What do you think? Do you like the Thirteen TV show? Do you think it should have been renewed for a second season? Yes,Yes it should be renewed. Intriguing story line. was very angry it ended. Please renew.